Some of you may have spotted Cambridge Independent’s front page. So lovely I’ve used it as an image on my Democracy Cambridge FB Page. Now, the site used to be many things. For centuries, it was a castle. Romans, Saxons and Normans all occupied it. Images from the Cambridgeshire Collection and the Museum of Cambridge. …and not all of the prisoners came out alive. An archival gem – and a morbid one. The last executioners of Cambridge County Gaol from the Cambridgeshire County Archive. In the mid-1800s a lovely courthouse was built. 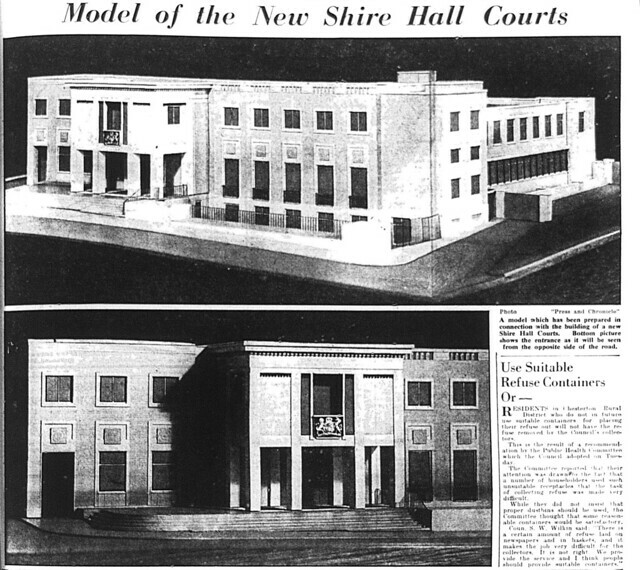 So whatever happens to the Shire Hall building, one thing we can say is that the use of the site has changed, ebbed and flowed throughout history. From the Cambridgeshire Collection’s microfiche archive, as buildings go I quite like this. But it never got built. So they tried again in 1967. I only found these a couple of hours ago in the newspaper archives. Many tried tall towers after the construction of The University Library – only Addenbrooke’s Chimney managed to get away with it until after the Millennium. Somewhere less expensive. Personally I think it’s an opportunity for local government reform – and to get a unitary authority for (Greater) Cambridge. Personally I’d recommend relocating a ‘North Cambridgeshire Council’ to somewhere like Wisbech – if only to help provide jobs and ‘concentrate the minds’ of councillors to improve transport infrastructure up there. God I hope not, but I wouldn’t put it beyond the wishes of a Conservative-led council. Personally I’d prefer to see the site staying in public hands so that a local council could benefit from the long term rent that would come from it. Personally I think it would be a scandal if it were sold of – simply because the site is ripe for turning into a proper heritage site. The Museum of Cambridge – AKA The Folk Museum was the brainchild of local folk historian of Cambridge and the fens, Enid Porter. While Enid was very much the historian for the people of the rural fens, I like to think that founding trustee Florence Ada Keynes (yes, her again) represented us townsfolk. The problem is that the site the museum is currently on is far too cramped for what it wants to do. There is no room for new exhibits. My plan is to rebuild the old courthouse as an expanded Museum of Cambridge, maintaining the existing site as ‘The Cambridge & County Folk Museum’. Keep the latter doing what it does well, and have this new Museum of Cambridge as the museum that tells the story of our city. For a start we could house the only remaining tram in existence that trundled the streets of Cambridge – currently at the East Anglia Transport Museum in Ipswich. It could also be a wonderful place to display photographs from the archives, and artwork from the past. Furthermore, it could also host video/film displays from archives such as the East Anglian Film Archive – such as this one on proposals to redevelop Cambridge in 1962. My take would be to rebuild a castle tower inspired by the drawings of the past, but have it designed and constructed so that it becomes taller than the top of Castle Mound – itself an ancient monument. That way you divert some of the crowds from a site at risk from erosion while putting a rooftop bar at the top that charges expensive prices for small glasses of wine like the Varsity Hotel does. Splendid views across the city and the building pays for itself. Why not have two in competition with each other? One at ground level where the courthouse is, and another in the new castle building? With the other two venues nearby – The Castle Inn and The Architect Pub, it then becomes a place to go in its own right due to the choice available. Assuming the hotel gets built, the eateries have a new, built-in market every night of the week. The risk with the bars and restaurants is you price people out. Personally I’d like to see a cafe run in partnership with Cambridge Regional College or similar, effectively serving as a training venue that they have on their King’s Hedges Road site as well as being something that can serve the less affluent end of the market too. It may also be an outlet for the Cambridge Food Cycle team for things like making cakes and salads as a revenue earner for them. Because I would love to see an expanded Museum of Cambridge to tell the story of our growing city.